Catherine was turning 50. Her life not what she had imagined. This occasion called for a symbolic celebration – a fresh start. The usual bucket list of activities – hot air balloon riding, white water rafting – didn't fit the bill. Skydiving was next on the list. "I remember thinking how scary it was – and how empowering," reflects Catherine. "What better way to mark this new time in my life than to take a leap of faith and jump out of an airplane." That was in 2005. She now has over 1,070 jumps and teaches others how to skydive. The skydiving lesson became a mantra for Catherine. "I teach other people how to jump so that I can remember why I learned in the first place. When I face something scary, I remind myself that I jump out of airplanes for fun. We all face moments in our life when we don't know what's next. In my life, I've realized that I need to challenge myself, my fears. And, I want to be a stronger person. For me, skydiving became the metaphor for this life lesson." Throughout the next 10 years, Catherine's life is peppered with leaps of faith including relocation to Erie as a single woman and a new career at Gannon University. A breast cancer diagnosis at 60 is Catherine's next leap of faith. 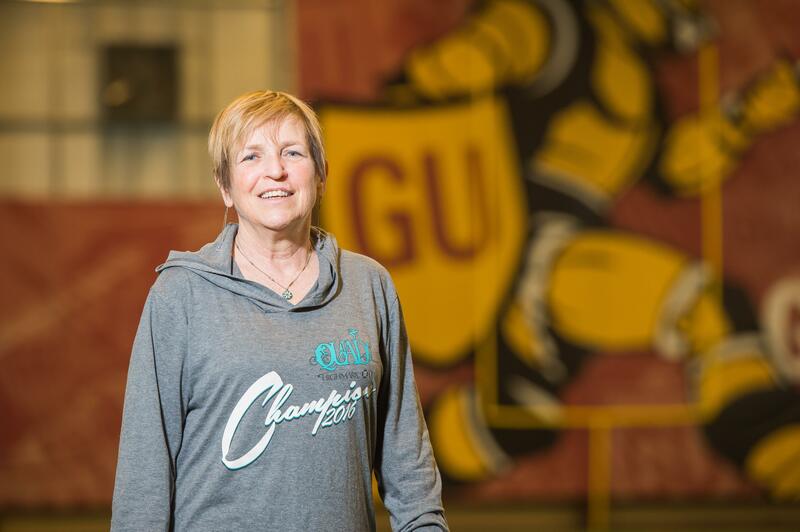 Chemo every two weeks and breast reconstruction – all while working full time at Gannon. It's during this journey, that Catherine receives an invitation to be part of Gannon's employee team participating in the Highmark QUAD Games, a series of four fitness events coordinated by the Y. Today, the YMCA of Greater Erie and supporters of the Highmark QUAD Games joined together for the announcement of this season. Catherine realizes how important physical and spiritual wellness is to her full recovery. While in the midst of chemo, she decides to sign-up and begins training for the first event – a 100-yard swim. "Here I am, the bald lady. I put my bathing suit on and begin practicing here at Gannon. One of the challenges with chemo is that on the 7th day you pretty much have no energy. I was determined to defy that. I was going to find energy. I kept going to the pool making sure that I could swim the required four lengths. Then, I had my last chemo treatment – just days before the QUAD swim." She completes her first length of the pool and is overcome with exhaustion; her mind filling with fear and doubt. A tearful Catherine recalls, "I remember thinking, I have to do three more lengths. I kept telling myself, that it was OK. The QUAD is not about winning- just participating. I don't have to win. For me, the win was that I was there. I realized I am the last person in the water. I finished all four lengths of the pool with my team on the deck supporting me." "I remember the day that I jumped out of an airplane and I needed faith and trust. I had to believe that it was my faith and trust that was going to get me through this; I am strong. People care and people help. And the QUAD Games are about being there – not winning. I was winning, I just didn't know it." "The QUAD Games just showed up at the right time for me. What better way to hang on to your strength than to train for an event? I had all of the folks from Gannon behind me, beside me and in front of me –supporting me. I realized in my year of treatment and healing and recovery, the QUAD Games was there –the Y was there. The Y gave me hope and a supportive community. The YMCA helped save my life."